Veronica Mars. Kickstarter. Most successful campaign in history. What more do you need to know? Okay, here’s more. Veronica Mars, the little series that lasted three glorious years on tv, is back with a movie. And not just any movie, but one that was a result of the fans getting together and throwing down their hard-earned money to make it happen. Now, with Comic-Con in full swing, the first footage (and more) from the Veronica Mars movie has been released. Yes, it’s been ten years and yes almost everyone is back. Veronica is a big city lawyer but gets pulled back into investigating one more case when something bad happens at her High School reunion. Will she figure it out in time to save more people from being hurt or killed? What do you think? Check out the footage after the break. 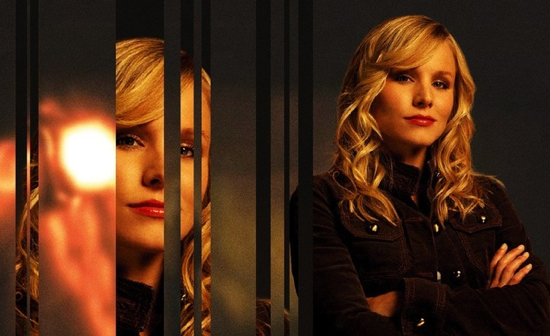 Look for the Veronica Mars movie to arrive in 2014. It should be no surprise that we support Sci-Fi around here. Even when it’s spelled Syfy. Regardless of how you spell it, a cool syfy show is a cool sci-fi show. Two of these cool shows are Warehouse 13 and Defiance, which has just been renewed for a second season. Both air on Monday nights on Syfy and we’ve got preview for Monday’s new episodes to share with you today. First off, during an all-new Defiance, Amanda & Nolan take a transport across the badlands to transport a prisoner. Of course, things don’t go as planned. Shocking, right? Then on Warehouse 13, it’s a black-and-white, noir episode with guest stars Missi Pyle and Enrico Colantoni. Those crazy kids from Galaxy Quest back together again. Good times indeed. 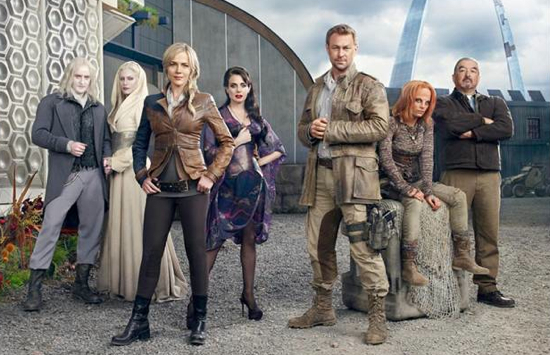 It all start Monday at 9/8C on Syfy with Defiance followed by Warehouse 13. Check out all the previews after the break. This week on an all-new episode of The Flickcast, Matt is back from vacation and has no problem sharing highlights from his trip. But wait, there’s more. Actually, it’s hard to describe just what happens during this week’s show, but suffice it to say, it’s a wild one. And yes, one of the boys (if not both) manage to offend someone this week. Shocking, right? They also make some picks this week including Matt’s pick of an obscure indie movie called Would You Rather? and Chris’ pick of the awesome show Veronica Mars, which he says is on Netflix but it really isn’t. He lies. Tagged: Jeffrey Combs, kickstarter, Movies, Podcasts, summer glau, The Flickcast, TV, Veronica Mars, Would You Rather? If you’re one of the many fans who were more than a bit disappointed when the CW pulled the plug on Veronica Mars, you may have something to finally be happy about. That’s right, thanks to Kickstarter, the often-discussed movie version of the show might just end up becoming a reality. Instead of waiting for a studio or other entity to fund a movie version of the show, series creator Rob Thomas and star Kristen Bell have decided to take the matter into their own hands and ask the fans to fund the project via Kickstarter. And fund they have. In less than twelve hours since the Kickstarter was launched, the Veronica Mars campaign had already broken the $100,000 mark. In fact, it’s already over $500,000 at this point. They’re looking to raise $2,000,000 in the next 30 days and who knows, at this rate, they might just get there. Getting a movie made this way is pretty awesome and opens up a whole buch of possibilities for other fan-favorites being funded this way. Firefly reunion movie anyone? So, if you want to see a Veronica Mars movie, now’s your chance to help make it a reality. For more, check out the video after the break. UPDATE: They are now over $2,000,00 and it only took about 12 hours. Amazing. It’s hard not to be at least curious about a show called Friends with Benefits. After all, who among us hasn’t secretly wanted to sleep with an attractive friend and, bonus, have no strings attached? I see some hands raised out there. That little revelation bring us to the new NBC show called, wait for it, Friends with Benefits — which has nothing to do with the recent movie of the same name, by the way. This show, which features Veronica Mars and Party Down alumni Ryan Hansen along with Danneel Ackles, Zach Cregger, Andre Holland and Jessica Lucas, is about a group of singles in their twenties and their romantic ups and downs as they try to maneuver the dating world. I know, I know. Anyway, to help spark your interest, we’ve got some previews for the how for you right now. In them you get to meet Sara and Ryan, two close friends looking for love. Ben may be picky, but at the end of his date, he might be justified while Sara starts to worry about her future. Friends with Benefits premieres tomorrow night (Friday) at 8/7C on NBC. I’m going to give it a shot because of Hansen. Click through to check out the previews. This week on The Flickcast, Chris and Matt are back and ready to talk about a whole bunch of new and sorta new topics. Yes, they sometimes repeat themselves. But with 70 shows in the can, it’s bound to happen sometimes. This week sees the boys talking about some of the new TV premieres this week including HBO’s Boardwalk Empire, Hawaii Five-O, season four of Chuck, The Event and more. They also discuss the merit of Disney movies, the return of other shows including The Big Bang Theory, Ryan Reynolds next projects, Jon Hamm as Superman, the awesomeness and success of Halo Reach and more. Chris and Matt also made some picks this week including Matt’s pick of the awesome Veronica Mars and and Chris’ pick of the upcoming David Fincher film The Social Network. If you were anxiously awaiting a movie featuring Kristen Bell and Christina Aguilera fighting it out to see who becomes queen of the neo-burlesque stage (undoubtedly while wearing skimpy outfits), then this is your lucky day. Why? Well, it seems Bell has signed to take a role in Screen Gems upcoming musical drama Burlesque, which features that exact scenario. Bell will play Nikki, the “loose-cannon lead dancer and main attraction” at the club who, to say the least, is not so pleased when Aguilera’s character suddenly gets the spotlight. Of course, an intense rivalry is formed which probably can only be resolved with song, dance and hopefully a good cat fight. Cher has already been cast as the nightclub owner in the film along with Stanley Tucci as the guy who helps turn Aguilera from bumpkin to bombshell — much like he did with Anne Hathaway in The Devil Wears Prada. Shooting on Burlesque begins Nov. 9 for a Thanksgiving 2010 release.